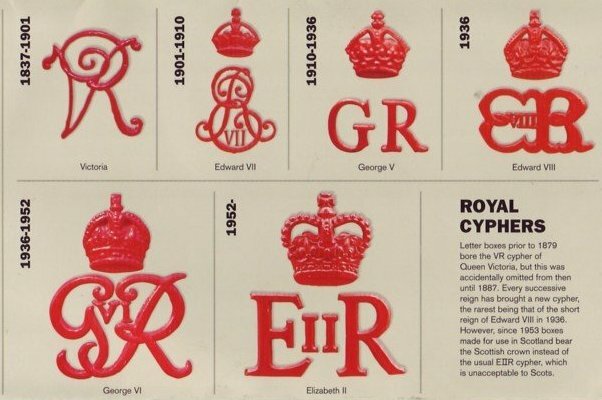 Many countries have issued stamps featuring their postboxes and in the case of many British Empire countries these are, of course, British designs. I'll be adding as many as I can find to this area of the site. 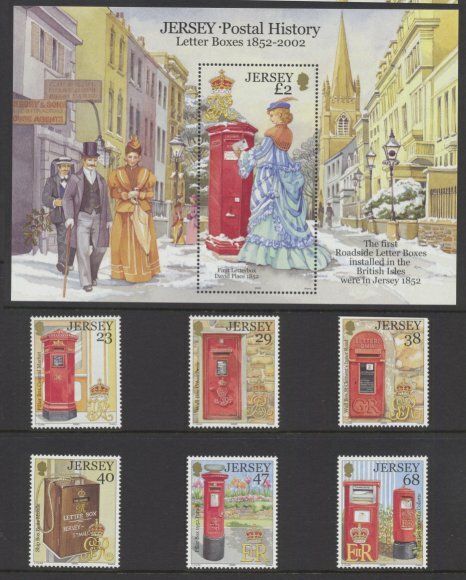 This superb set was issued in 2003 by Royal Mail to commemorate the 150th Anniversary of the mainland letter box. The stamps are printed in intaglio from engravings made by Czeslav Slania, the famous and incomparable Polish engraver who died in 2004. 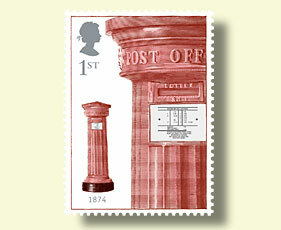 The stamps are: Horizontal Fluted, London Ornate, Type C pillar with white black-out base and gas detector paint on cap, Gibbs K-type pillar and Airmail GR pillar. 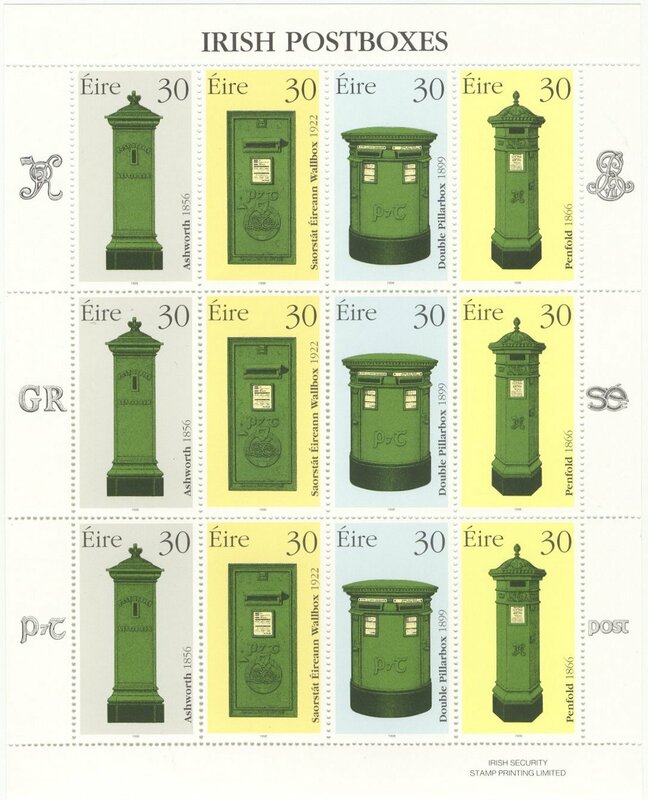 Certainly one of the best modern sets on the subject was that issued by the Republic of Ireland in 2000. The boxes are beautifully drawn and the miniture sheet also gives you thumbnail sketches of the various ciphers in use. The boxes include the Ashworth PB1 now in the Collins Barracks outstation of the National Museum of Ireland, a large wall box with SE door (Saorstat Eireann / Irish Free State), a "C" type box with P7T cipher and the small Penfold in green from Bray, Co Wicklow. The ciphers are clockwise from the top left: VR Penfold, E7R Scroll, Saorstat Eireannn, An Post, Post and Telecom P7T andGeorge V all of which may be seen in a one hour stroll around Dublin and Bray. 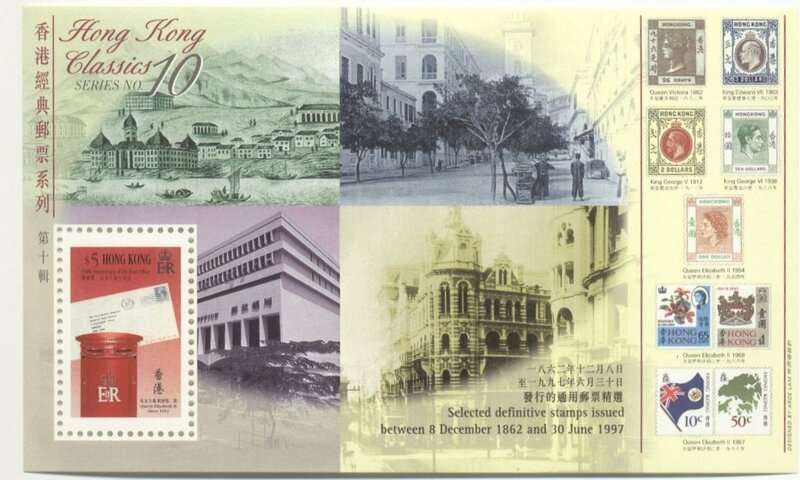 The Hong Kong Miniature Sheet comes from a 1997 pre-handover issue celebrating colonial post boxes in the territory. The full set of five stamps is displayed below. The box shown is a locally made E2R pillar type B. 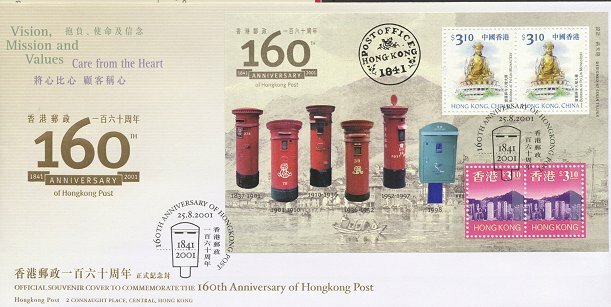 This rather interesting FDC commemorates160 years of Hong Kong Post. The design is, of course, a mess. But it was used to introduce the new definitives post-handover featuring a pair of these and a pair of transitional rule definitives. 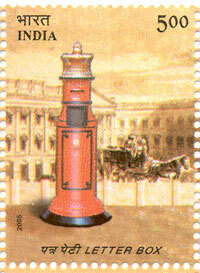 The post boxes are a similar mish-mash of styles, sizes and photographic angles. This superb booklet pane was issued in 1974 in a Gibraltardefinitives promotional book. 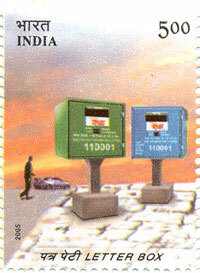 It is very unusual in that the stamps are unperforated and self-adhesive. This is one of the first ever self-adhesive issues. 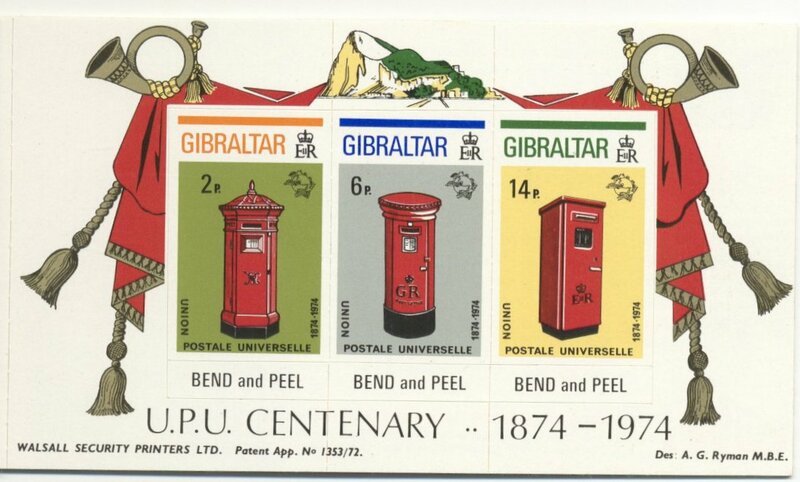 The stamps were in regular use in Gibraltar at this time as adhesive perforated issues; only the booklet contains this version. There are no Penfold boxes in Gibraltar although many other interesting British boxes can be found there. An unadopted essay by Geoffrey Matthews for the 1969 Post Office Technology issue. 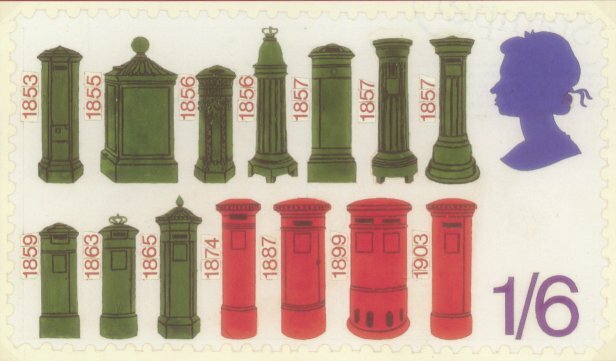 It depicts a complete run of early pillar boxes, starting with the earliest Channel Islands box up to the first of the Edwardian boxes. It was published as a postcard to promote a recent Philatex show in London. 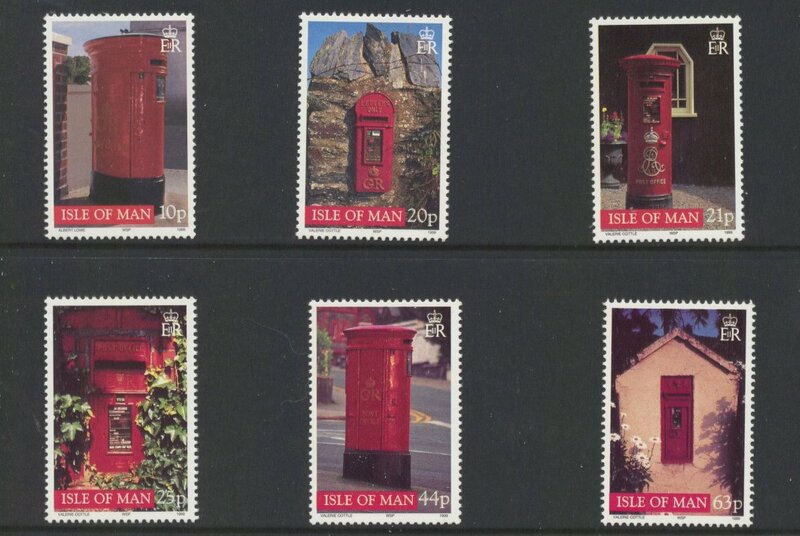 This Isle of Man Minature Sheet is interesting as it shows the only Penfold on the island. The box is located, as can be seen, on the now bleak and windswept platforms of Douglas Station. These formerly sported superb cast iron canopies, but the State Government scrapped them in the 1980s. The post box itself is a 1988 Machan Replica; were it real, it would have been contemporary with the Beyer Peacock 2-4-0WT departing with a train for Port Erin on the now much-truncated IoM Steam Railway. 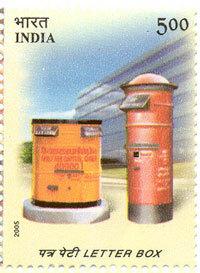 Thailand issued this attractive set several years ago showing their local style of post box. A 2003 set from Malta, another former colony sporting an excellent range of British boxes. The 76c value shows a locally made box. The photography in this 2003 Isle of Man issue is hard to fault, but the box selection is curious. Both 10p and 44p depict the same type of box - OK, it's rare, the PB29 TypeD pillar with built-in Stamp Machine and yes, there are two on the island, but even so... There are plenty of other more interesting boxes they could have chosen. 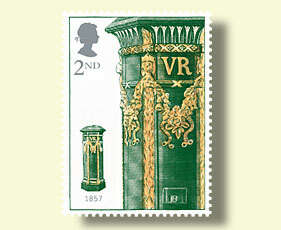 The Edward VII pillar is rather superb though and features in the Presentation Pack too. Now Zimbabwe, this Rhodesia set from the pre-1980 era shows a British pillar being emptied. Isle of Man pillar in the snow and a locally made Victorian box from Australia and another British style box from Portugal. A very attractive set from Bermuda depicting four British boxes including the George VI Type B wall box and the "jutting aperture" EiiR pillar by Carron Company. This is the full set from the Hong Kong issue of 1997. The boxes are VR Jubilee pillar, EdwardVII short door, locally made George V, locally made George VI and locally made EiiR box. The GvR box is of the same type that we have in the Museum. 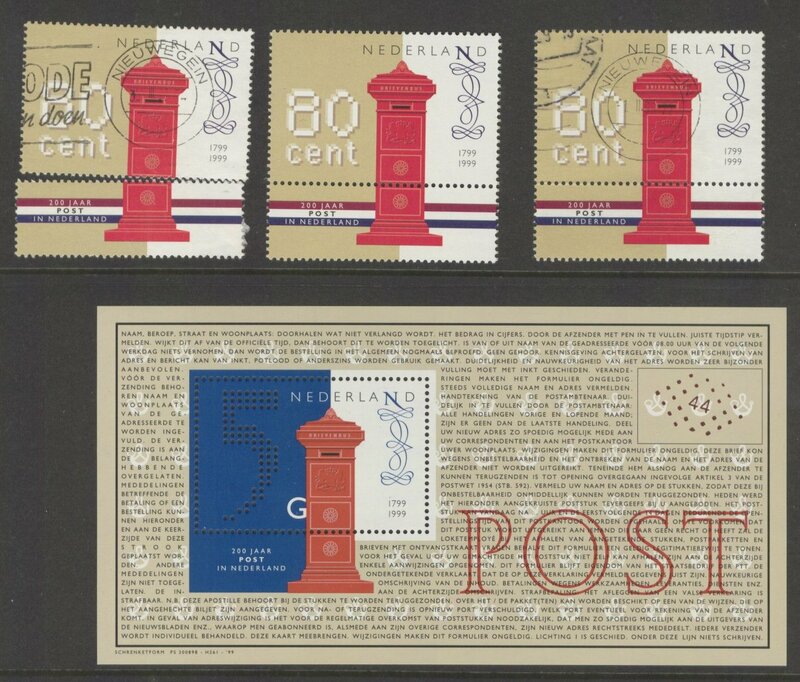 2002 Netherlands Post issue celebrating their old post boxes. A few have survived in museums - notably Aviodrome at Lelystad. Click the image to see a rare example still on the street. Another view of the famous Union Street Guernsey box by Vaudin from 1852. 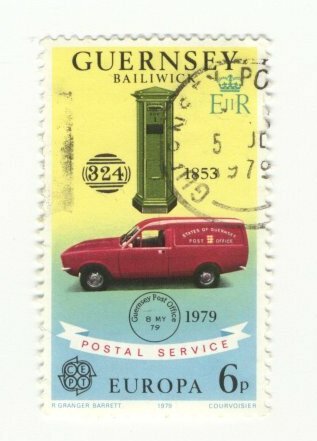 It has appeared on several Guernsey stamps over the years. Jersey was also home to Vaudin boxes, although they have to make do with a wooden replica these days. The EiiR pillars on the other hand, are prolific across the island. 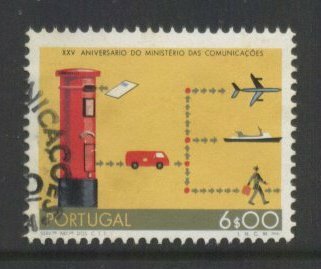 For many years Portugal sourced pillar boxes from the same Scottish foundries as the British Post Office. Why let the fact that you have not actually managed to keep one of the Vaudin boxes stop you from putting it on your high value minature sheet? They may only have a wooden replica, but Jersey Post pulled out all the stops to let everyone know that they got their first boxes in November1852 (hence the snow), whilst Guernsey had to wait three months. The inspired choice of boxes in the low value series includes, on the 38p, a "round-top GRV wallbox" according to the blurb. 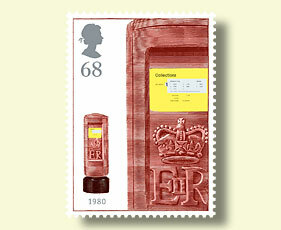 Of course this is actually a GvR Lamp Box built into a wall, but why let accuracy get in the way of a good stamp? The Gibbs K type on the 68p is nice, but the contractor seems to have left the lifting ring in position! If you've got it, flaunt it! No expense spared here. Guernsey used a real photograph apparently, although heavily retouched to remove the iron railings on either side of the box. 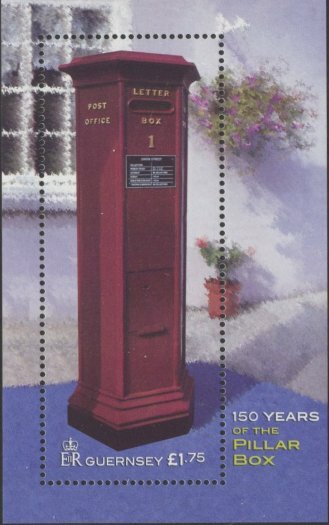 Sadly, the fact they have the oldest working pillar box in the world did not inspire them to commemorate the 150th anniversary of its siting with a matchinglow value set. In fact, there are hardly any other "old" boxes left in Guernsey, so maybe that is why they did not bother. 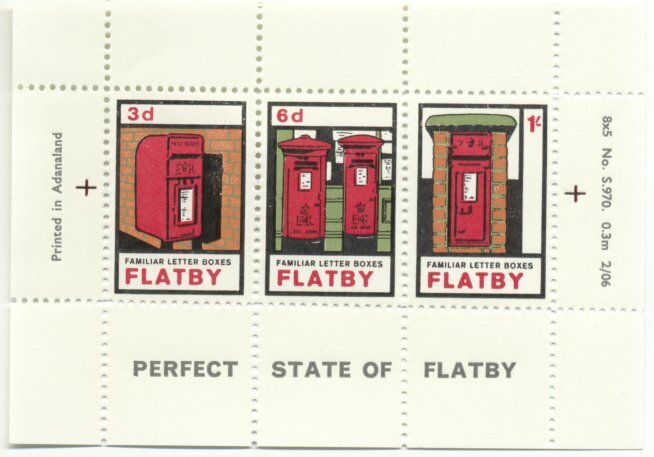 The very latest set to arrive are these charming stamps from the Perfect State of Flatby. This elusive territory is described as being "a secessionist coastal territory somewhere near Essex" whose stamps are printed by the postal authority of neighbouring Adanaland. The currency in use remains the old British Lsd system. 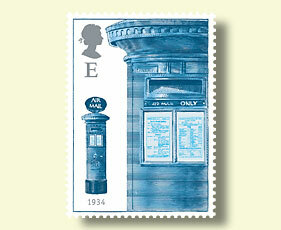 The stamps depict a selection of Flatby's local boxes, including the A & B pairing in the High Street. We have just 12 copies of this miiature sheet for sale to collectors at our Open Day on the 9th July 2006. Any unsold after that will appear on our Museum Shop page here on the site. The price is 3 per sheet. 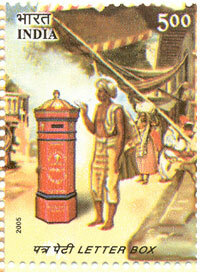 In 2003 India issued this interesting set as a miniature sheet. 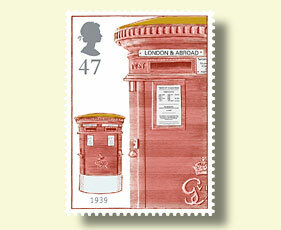 It features two "colonial" style boxes, many of which were sent out from the UK. Others were little more than copies made by local foundries.